The German cockroach is the most common pest species of cockroaches and is of the greatest importance for public health and food safety. Found throughout structures, they have a preference for warm (70°/21°C), humid spaces. Often found in kitchens and bathrooms, but infestations can happen anywhere. Prime locations for harborage, where they spend 75% of their time, are any cracks or crevices near a source of food and water. First instar nymphs need only a 1/32 of an inch (1 millimeter) crack, where adults require 3/16 of an inch (5 millimeter) in width. Infestations are often introduced via paper products or paper packaging, such as cardboard boxes, or through secondhand appliances, rental furniture and deliveries. Levels of activity can vary according to gender and life stages. Reproducing females are quite active, while gravid females (females with ootheca or egg capsule) are inactive – only going to food and water when necessary – starting the fifth day after mating. Males spend most of the time in harborage. All nymphs become immobile and remain in harborage 3 days prior to molting, which is why a third of the time nymphs are not found during inspection. The German cockroach has been implicated in outbreaks of illness and the transmission of pathogenic organisms, including at least one parasitic protozoan. It is also often the cause of childhood asthma and allergic reactions in many people. Adults are about ½-5/8 of an inch (13-16 millimeters) long; light brown to tan except for two dark, almost parallel longitudinal stripes/bars/streaks on pronotal shield. Females are darker with a broader abdomen. Rarely glide or fly. Almost anything with nutritional value, as well as materials such as soap, glue and toothpaste. A female will carry her ootheca until it is within one to two days of hatching. She will then deposit it in a sheltered area. The small, bean-shaped ootheca is yellowish brown, but usually two-toned, with a paler end; ¼-3/8 of an inch (6-9 millimeters) long. From egg to adult takes two to seven months, averaging about 103 days; under conditions of 80°F/27°C and 40% relative humidity, only 60 days are required. This can mean three generations per year. Adults live 100-200 days. 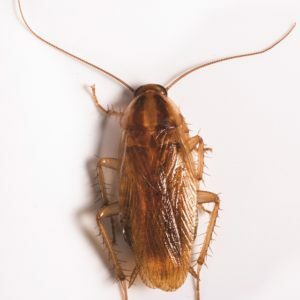 German cockroaches reproduce so quickly that infestations can easily get out of control without a good pest management program. Resistance to current pest control materials develops rapidly.